The current pair of sandals I'm using dates back to forever - so I bought a pair of Havainas flip-flops. Fun-looking huh? Yeah... I figured pink hearts aren't really my thing. Why not get a new pair of havaianas? 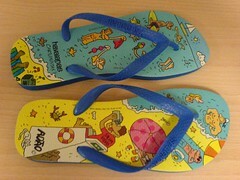 They have the new 2007 Havaianas out check them out !! havaianas are the best ..